Celebrating the 100th birthday of Jacob Lawrence (1917-2000), this exhibition features 26 graphic works done between 1971-1997. Included are his Hiroshima Series of 8 prints, the Genesis Series of 8 prints and 10 prints from the Toussaint L'Ouverture Series, Also included are text panels with an introductory exhibition essay, a chronology, and photos of the artist. The exhibition inlcudes an essay about Lawrence and his printmaking by Peter Nesbett. Nesbett is the Editor of Jacob Lawrence: The Complete Prints (1963-2000) / The Catalogue Raisonne. The works come from the collection of Alitash Kebede of Los Angeles, CA. 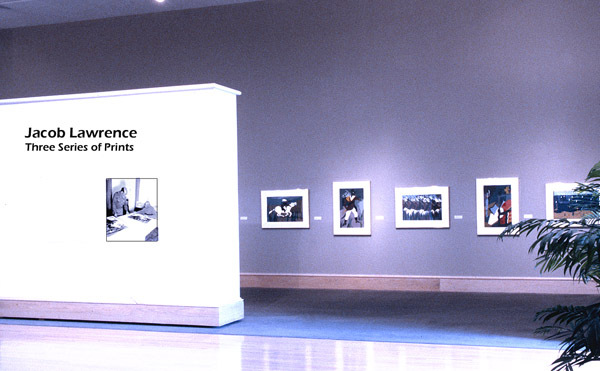 The exhibition and museum tour are organized by Landau Traveling Exhibitions of Los Angeles, CA. Since his first published print in 1963 Jacob Lawrence has produced a body of prints that is both highly dramatic and intensely personal. In his graphic work, as in his paintings, Lawrence has turned to the lessons of history and to his own experience. From depictions of civil rights confrontations to scenes of daily life, these images present a vision of a common struggle toward unity and equality, a universal struggle deeply seated in the depths of the human consciousness. Lawrence was born in Atlantic City, New Jersey, in 1917 and passed his formative years in New York City’s Harlem neighborhood. In the mid - 1930s he took art classes sponsored by the College Art Association and the WPA, at the Harlem Community Art Center and, following a two-year scholarship to the American Artists School worked in the easel division of the Federal Art Project. In 1941, Lawrence became the first African American artist included in the permanent collection of New York’s Museum of Modern Art, where he had a one-man exhibition in 1944. He lived and worked in New York City, teaching at numerous schools and universities until 1971, when he accepted a full-time faculty appointment at the University of Washington in Seattle, from which he retired as professor emeritus in 1983. 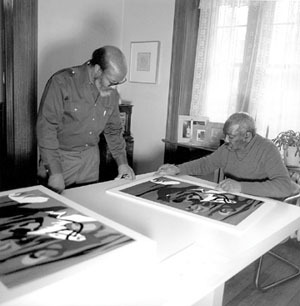 Jacob Lawrence received numerous awards and honors, including the National Medal of Arts (1990), the NAACP Annual Great Black Artists Award (1988), and the Spingarn Medal (1970). His work has been the subject of several major retrospectives that have traveled nationally, originating in 1986 at Seattle Art Museum, in 1974 at the Whitney Museum of American Art, and in 1960 at the Brooklyn Museum. (Seattle: Francine Seders Gallery, 2001).